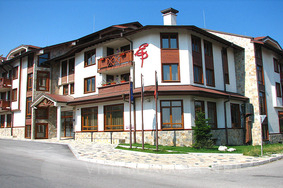 Evelina Palace hotel in Bansko, ski resort in Bulgaria. Book online with discount. 14=12; 7=6 during the period 01 Dec - 20 Dec 2018; 13 Jan - 25 Jan 2019; 24 Feb - 31 March 2019. Location: Located on the west coast of Glazne river it’s on the main road to the cabin lift and about 100 m from the city center. The hotel is build with typical bulgarian architecture for the region and is furnished with style, setting warm and comfortable mood. You will be welcomed by professional team who will make sure that everything will go smooth for your holiday, conference or gala evening. Accommodation: The hotel offers 42 double rooms, 3 suits, 2 apartments, all luxury furnished. Each one is equiped with satelite TV, direct phone, minibar, hairdryer and has a balcony. Restaurant and Dining: In “Evelina Palace” Hotel there is classical 90 seats restaurant. With it’s cosy atmosphere is a great place for your business lunch, romantic dinner or noisy party.The restaurant offers rich menu of sea delicacy in Mediterranean style, typical Bulgarian food and typical Bansko courses.You’ll be welcomed with perfect services. Spa center: Our SPA center offers one of the biggest indoor pools in the region, kids place, fitness, sauna and differend kinds of massages. In addition to all that is solarium, djacuzzi and turkish bath. Summer garden: In the beautifully arranged summer garden with barbeque and kids place, everyone can relax in the warm summer nights.